If you’re anything like me, your love of cooking and eating usually translates into some nasty food stains all over your favourite clothes. But not all food stains can be treated and removed the same way. Which food gave you the toughest food stain you’ve ever had? How did you manage to get it out, if you did? 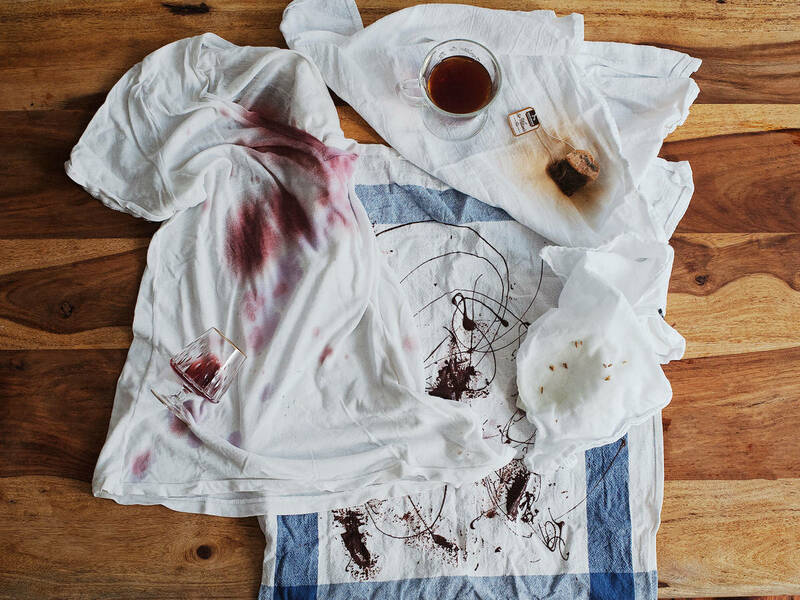 To make sure that you’re never left with a ruined shirt again, here are our top four food stain fixes. Oils and fats (like butter, meat fats) can’t be cleaned the way most other stains will be, and because of this, they usually make the toughest stains to clean properly. The oil molecules repel water, actually intensifying and spreading the stain if touched with water. So instead scrape any residual fat from the clothing and sprinkle with a heaping pile of corn starch or talcum powder (which acts as a natural absorbent) and let it sit on the stain for at least an hour. Now shake the powder off and the stain should appear visibly faded or completely gone. Launder as usual to completely remove any of the remaining stain. A red wine stain’s natural nemesis is its brother, white wine, or better still, white vinegar. The acetic acid in the white vinegar will break up the residue of the red wine, so pour white vinegar over top of a stain immediately to flush out the wine and blot in between with a paper towel or napkin. The stain should be gone, but you’ll probably want to throw the garment into the wash to get the vinegar smell out. These stains tend to be less intense than others, as both coffee and tea are simple dilutions of water and the brewed bean or tea plant, so begin by running them under cold water first. If the stain persists, rub a small amount of dish or laundry detergent into the stain, either with an old toothbrush or by rubbing the garment between itself to loosen. Rinse with cold water to complete. Chocolate is another notoriously tricky stain to remove because not only does it contain fat compounds (this is the cocoa butter) meaning that the stain repels water, but it also contains the colour compounds (cocoa powder) that has melted into the fat. In this case, rub a mild detergent into the stain to both remove the grease of the fat and the colour of stain in one go. Let it sit for several minutes before rinsing and, if necessary, repeat until the stain is removed. In addition to other kitchen staples, a well-stocked kitchen has to have cornstarch, white vinegar, and a basic detergent to combat the food stains that come with eating and cooking. When in doubt, basic white vinegar is a good natural starting point for a stain. It might seem obvious, but the sooner you get to a stain, the easier it is to get out. For set-in stains, I like to use a soft toothbrush to rub in detergent with extra vigour. Now you’ll never be in the dark with your food stains.